Go Go’ers, February was so packed with fun and frivolity that Ms. Go Go is just now pausing for breath. Good thing we had that extra Leap Year day to stave off boredom. March is already proving to be no slouch in the Get Up and Go Go department. Ms. Go Go knows you will not disappoint. 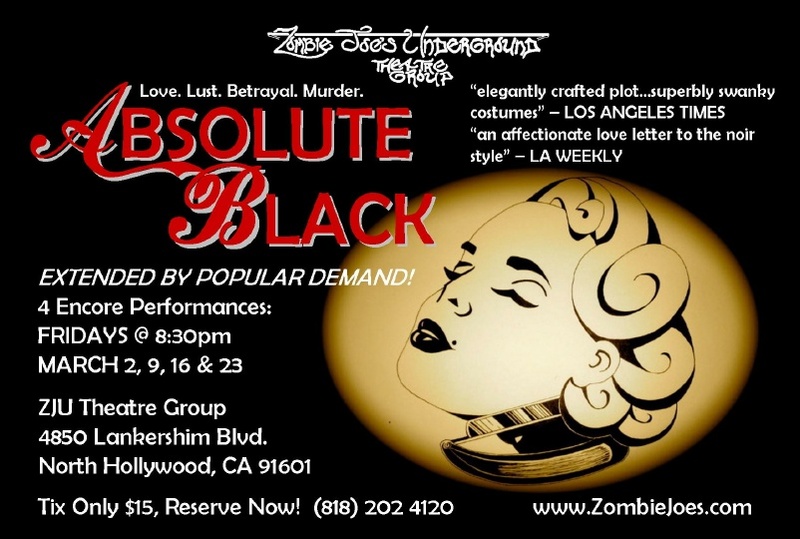 ABSOLUTE BLACK — writer/director Vanessa Cate’s smartly seductive homage to noir ‘n 1940’s-inspired nastiness — was such a hit in its recent, four-week run at ZJU Underground Theater that it’s back for another month of dead dames and dapper detectives. Anchored by an oh-so-talented cast, sparked by deft dialogue, and enhanced by detail-perfect, period costumes, Cate’s tightly plotted whodunit clocks in at just an hour long, which gives you plenty of time to crawl inside a post-finale cocktail at the Prohibition-era Federal Bar nearby. You love a little mayhem with your martini. As Go Go’ers have probably gathered, Ms. Go Go is all about maximizing fun time. Why do just one fun thing when you can do three or four? Seriously, no slackers in the fun department. For an all-inclusive-fun Saturday, hit up the Big ‘Cap Food Truck Fest at Santa Anita Park where you can sup at 50 gourmet food trucks, sip on 20 craft beers, and hopefully, get your betting slip kissed by Lady Luck. The whole shebang takes place in the infield of the Santa Anita Race Track so you can eat, drink, stroll around, watch the ponies from a whole different perspective, and hit up the satellite betting. Ms. Go Go admits to rooting for “Uh Oh Bango” based on the horse’s name alone. Kids can look forward to bouncy things and face painting — Ms. Go Go bets unicorns rule at the latter — and everyone can bounce around between races to live music by Fallen Riviera. For Go Go’ers who like to sport Derby-esque duds like slick suits, pretty dresses, and grands chapeaux — presumably not all at the same time — there’s a Best Dressed contest with a $500 gift card to Santa Anita Westfield Mall awarded to one male and one female winner. You can never have too many giant lady hats at a food truck festival. Here’s the best use ever of two wheels on the Westside….Sunday’s first ever Tour de Taste offers a gorgeous bike ride in glorious weather with snacks and drinkies to look forward to at the finish of your lap through the newly, environmentally enhanced Ballona Creek bike path. Ms. Go Go feels healthier just reading about it. Don’t expect a furiously pedaling clutch of cyclists fighting for dominance on the straightaway while sand crabs scuttle away in fear. The twelve-mile path is flat, the pace leisurely, and guided groups will be small at this Los Angeles County Bike Coalition event whose proceeds go to make L.A. County a “better, bike-able place”. In addition to Making A Difference, your end-of-day reward will be a wristband passport to local, Culver City eateries like Rocco’s Tavern, Sake House by Hikari, LaRocco’s Pizzeria, Chipotle, and Rush Street. On-site sponsors include Pace, Pete’s Cafe & Bar, AMMO, and Larchmont Grill. There will be plenty of vegetarian and vegan options so you can keep that healthy and virtuous glow. Speaking of glow, bring your ID if you’re planning to enjoy adult bevs from New Belgium Brewing Company and Gold Award-winner Rosenthal Estate Wines and don’t forget your helmet if you plan to ride. You’ve been wanting to debut your helmet-with-a-Mohawk…. BONUS! Check out Ms. Go Go’s alter ego report on Old Town Pasadena Happy Hour Week for Eat: Los Angeles.